Grand Master Carlos Gracie Sr.
Gracie Jiu-Jitsu is a system of one-on-one ground fighting, where the objective is to achieve a superior position for joint locks, chokes and strikes. Some Historians say that Jiu-Jitsu is the oldest form of martial art having originated in India more than 2,000 years before Christ. It was originally thought to have been developed by Buddhist Monks. Concerned with self-defense, these monks created techniques based upon principles of balance and leverage, and a system of manipulating the body in a manner where one could avoid relying upon strength or weapons. With the expansion of Buddhism, Jiu-Jitsu spread from Southeast Asia to China, finally arriving in Japan where it developed and gained further popularity. However, with the passing of the Tokugawa era (ca. 1800), Japan became somewhat united and there were many changes in Japanese society. One of the results of these changes was the reduction of the Samurai warrior to the status of the common citizen. In his new position, the Samurai could no longer carry a sword. He was forced to rely solely on empty-handed techniques as a means of defending himself. Over the years, since the reforms imposed by the Meiji restoration in Japan in the 1900s, Jiu-Jitsu became practically extinct in that country surviving only as a very restricted sportive form of Judo. Evidence also shows us that Jiu-Jitsu techniques, although not necessarily under that name at the time, were included with warrior training in several countries circa 1100AD. In the last days of 19th century, some Jiu-Jitsu masters emigrated from Japan to other continents, teaching the martial arts, as well as competing in fights and competitions. Esai Maeda Koma, also known as "Conde Koma," was one such master. After traveling with a troupe who fought in various countries in Europe and the Americas, Koma arrived in Brazil in 1915 to help establish a Japanese immigration colony in that developing country, where he met a man named Gastao Gracie, a Brazilian scholar and politician of Scottish decent. Esai Maeda was aided in that endeavor by Gastao Gracie. The father of eight children, among then five boys and three girls, Gastao became a Jiu-Jitsu enthusiast and to show his gratitude to Gastao, the Japanese Jiu-Jitsu Master Esai Koma taught the basic secrets of that ancient fighting style to Gastao’s oldest son, Carlos Gracie. For a naturally frail fifteen-year old Carlos Gracie, Jiu-Jitsu became a method not simply for fighting, but for personal improvement. 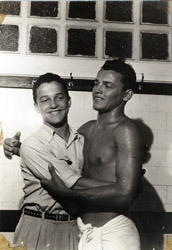 At nineteen, he moved to Rio de Janeiro with his family and began teaching Esai Maeda's techniques to his brothers: Oswaldo, Gastao, Jorge and Helio Gracie. Carlos and his brothers expanded on their grappling knowledge, developing new and innovative techniques. In 1925, he opened the first school, known as the "Academia Gracie de Jiu-Jitsu (Gracie Jiu-Jitsu Academy)", in Botafogo, a district of Rio de Janeiro, Brazil. Carlos and his brothers actually changed the original art, adding new techniques and discarding older, less efficient ones. At that point, Jiu-Jitsu began its evolution from the old and limited Japanese art of Ju Jutsu into a far more efficient and complete fighting system. 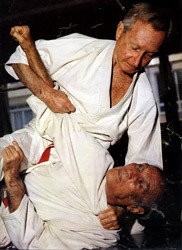 In the course of his development Carlos Gracie began competing in the martial arts. He started to share his knowledge with his brothers, adapting and refining the techniques to the naturally weaker characteristics of his family. Also, Carlos taught them his philosophies of life as well as his concepts of natural nutrition. Eventually, Carlos became a pioneer in creating a special diet for athletes, "the Gracie Diet," which transformed Jiu-Jitsu, his family’s art, into a term synonymous with health. Carlos developed an interest in no-rules type competitions. He learned through these competitions and street situations that almost all fights end up on the ground. In his travels, Carlos would teach classes, but he also proved the efficiency of the art by beating adversaries who were much bigger and more physically gifted. He took what he learned and developed it further through these no-rules competitions and street fights until it became the martial art we know today as Gracie Jiu-Jitsu or Brazilian Jiu-Jitsu (BJJ). Attracted to the new market which was opened around Jiu-Jitsu, many Japanese practitioners came to Rio de Janeiro, but none were able to establish schools as successful as the Gracies. This was due to the fact that the Japanese stylists were more focused on takedowns and throws, and the Jiu-Jitsu the Gracie's practiced had more sophisticated ground fighting and submission techniques. At around this time, the “Vale-Tudo” MMA Style of fighting was born. Carlos and his brothers changed the techniques in such a way that it completely altered the complexion of professional fighting itself. No longer was fighting thought to consist only of striking and kicking; now ground fighting had become its equal. 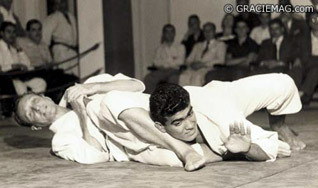 These ground fighting techniques were so distinctive to Carlos and his brothers that the sport became attached to a national identity, and is now commonly known as "Brazilian Jiu-Jitsu," practiced by artists all over the world, including Japan. Carlos and his brothers passed this new form of Jiu-Jitsu on to all in their families. Having created an efficient self defense system, Carlos Gracie saw in the art a way to become a man who was more tolerant, respectful, and self-confident. With a goal of proving Jiu-Jitsu’s superiority as well as to build a family tradition, Carlos challenged the greatest fighters of the time, as well as managing the fighting careers of his brothers. Fighting opponents fifty or sixty pounds heavier, the Gracie's quickly gained recognition and prestige. Gracie Jiu-Jitsu became increasingly popular and now has a large following in the South America, North America, Europe, East and West Asia, realizing Carlos original dream to spread Jiu-Jitsu around the world. 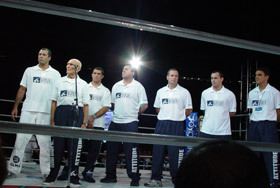 With the creation of an official body overseeing the administration of the sport, the rules and the ranking system started the era of sport Jiu-Jitsu competitions. Today, Gracie Jiu-Jitsu is being spread worldwide thanks to Carlos Gracie Sr. teaching his brothers, sons, and grandsons. Welcome to the next generation of Gracie tradition!